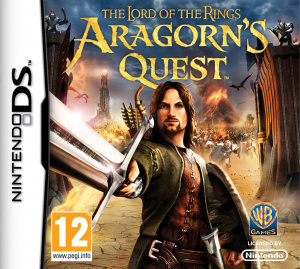 Released in parallel to the Headstrong Games-developed Wii title, it is worth noting that the DS version of Lord of the Rings: Aragorn's Quest is a separate game, not just a handheld port of the Wii version. It shares similarities with the Wii game, predominantly in its hack-'n-slash gameplay, but it distinguishes itself in the way that it presents its stat-building character development as an alternative to the broad, accessible gameplay focus of the Wii title. Aragorn's Quest is presented from an overhead viewpoint and it plays like a single player top-down adaptation of a scrolling slasher like Golden Axe, therefore anyone who is pining for the M.I.A. DS version of Gauntlet will not be able to team up with their dungeon crawling buddies here. The lack of co-op is the biggest disadvantage it has over the Wii game – this DS ranger needs multiplayer badly, and the gameplay feels more repetitive without it. 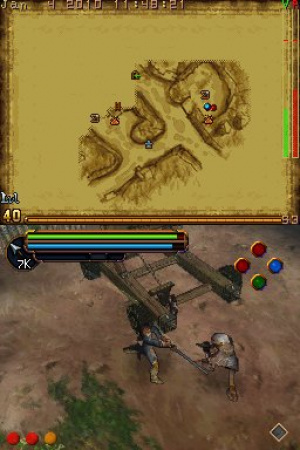 The top-down perspective may suggest comparisons to an adventure game like The Legend of Zelda: Spirit Tracks, but its gameplay is much simpler than that. It has far less exploration than Aragorn's Quest on Wii and whilst you will repeatedly search for keys and mechanisms to unlock level progression, all eight hours of this DS game are linear. You will not have to solve puzzles and you can see everything the game has to offer after your first playthrough. The story has links to the Wii version in which Samwise Gamgee's kids are bored of him rattling on about how he helped Frodo clamber up Mount Doom, so he sits down by the fire at Bag End and tells a more action-packed story about Aragorn getting into lots of scraps. The player controls Aragorn, with the role of Sam and his kids being confined to cut-scenes, so there is not an extra Shire-based tutorial hub-section here. However, it is clear that TT Fusion are fans of Tolkien's story, as even with the focus on Aragorn's part in the adventure the team still packed 17 chapters into the DS game. 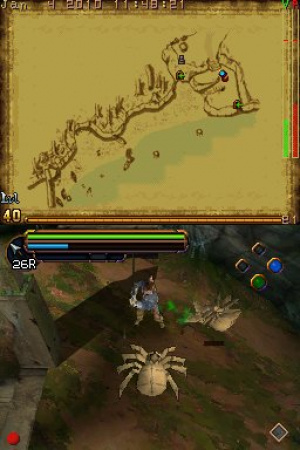 Players are treated to a variety of locations which were not available to play in the Wii version, including the snow ravaged Path of Caradhras, a boss battle with The Watcher in the water outside Moria and a route past the Dead Men of Dunharrow. Visually the game does not look strong in screenshots, but it is better moving. The engine performs well at showing the multi-tiered design of the environments, an example of which is the varying height perspective as Aragorn climbs to the upper battlement of the white city of Minas Tirith. The variety to each backdrop effectively depicts the scope of the journey, but whilst it is fun to commandeer a ship from The Corsairs of Umbar, some areas like Moria are dark and dull. The audio quality varies; the voice acting by Sam (Sean Astin) works well in narrating the story, but what starts out as an atmospheric film-based score becomes repetitive as many tunes are looped too often during a level. 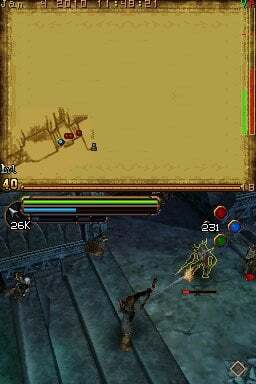 The focus on the DS game is on its combat and consequently it feels like more of a traditional gamer's title, in which the majority of the time you will be unleashing a barrage of flailing sword strikes. The system is simple with basic light and heavy attacks, but it becomes fun when you learn the timing of the B block button, so that it parries an enemy to stun them and opens up their defences for a flurry of attacks. The enemy's AI often attack in groups of three and they are split into grunts and leaders. An Orc captain can regenerate his men's health, but when he has been defeated his minions will scarper and can be easily picked off. By repeatedly attacking enemies Aragorn builds up a blue morale bar and each time he levels up he earns an ability point, which can be spent on a variety of special attacks. As you begin to master the controls, you learn to prioritise who to attack first, as disabling distant archers and foes with stronger defences is most important, because if enemies gang up on you it is more difficult to time a parry. This game is most fun when you mix up attacks; for example you can charge in with a special 'Sword Thrash' attack to stun a group, and then parry anyone who it missed. Following up with a chain of combo strikes and finish off any stragglers by unloading arrows into them when they are knocked down to the floor is a smart move too. One way in which the game caters for core gamers is through its levelling up system of gaining experience and acquiring stronger equipment. This feature worked well in classic hack-'n-slash titles, like Capcom's Dungeons & Dragons: Shadow over Mystara, and it is a welcome addition to this game. The Wii version shied away from stats in order to achieve accessibility, but the DS game embraces them. You are awarded experience to level up Aragorn as you progress, and extra equipment can be found in chests scattered amongst the levels. It is also possible to achieve upgrades to your health and each new piece of equipment has a varied impact upon the stats for your sword's attack power, the bow's range and Aragorn's defence performance. This adds much-needed depth, but the emphasis upon empowering Aragorn becomes a double-edged sword. Unfortunately, apart from a very slight difficulty spike in Chapter 6's Balin's Tomb, the equipment system and levelling up of Aragorn's character makes him too powerful and subsequently the game is easier to beat during its final chapters. This problem is exaggerated as the game only allows the player to choose two difficulty modes from the outset, Hobbit and Ranger. The hardest 'King' difficulty is unlocked after completing the 17 chapters, by which time you will have seen everything the game has to offer and a level 39 Aragorn will have slain The Mouth of Sauron as if he was battling a lowly goblin. The incorporation of stats and a fun parry-based combat system is not enough to hide the limitations of the hack-'n-slash genre, in that too much of the game's pacing feels like a repetitive slog. It uses the touch screen in a very limited manner, to trace the rune shape to open a Dwarven door, but this does not provide much impact upon adding diversity to the gameplay. Boss battles against troll guardians, as well as being chased by The Balrog and firing back at archers through arch windows help to break up the repetition, but this game would have benefited from more variety to its set-pieces. This is especially important for a handheld game, as the levels average at approximately 35 minutes in length, so it is more enjoyable to play Aragorn's Quest in short bursts, especially as it's generous with its mid-level save points. Being able to return to any chapter once it has been completed to further build up your stats adds to the replayablility, as does unlocking five different arenas to play against an arcade-style onslaught of wave attacking enemies. Ultimately the strongest selling point is that there are not many alternative scrolling hack-'n-slash games on the system and it stands up well against other licensed games in this genre, such as Star Wars Episode III: Revenge of the Sith. The portable version of Aragorn's Quest is different enough to provide a satisfying supplement to the Wii game, however its focus upon levelling up your character and acquiring stronger equipment becomes detrimental, because consequently the game is too easy to complete. 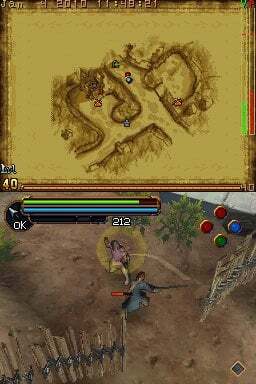 The lack of co-op adds to the repetition of its hack-'n-slash gameplay, although a combat system which involves parrying strikes, alongside flailing forward with a combo of basic and special attacks, helps to make each battle fun. The different locations combine to ensure that this eight hour adventure is full of fan-service, although its lack of variety is best enjoyed during short bursts of play. I had the Wii version on my radar but have decided to go for it when cheap/bargain binned. You've reviewed the Move version of this (6/10) so how about a Wii review? @LEGEND MARIOID There'll be one. There is no two ways about it, I am a fan of The Lord of the Rings, even if it did take me a whole summer to read the books when I was 16! Therefore, I think that other Middle Earth fans will be most forgiving of the repetition and easy difficulty level to be found here, plus they will appreciate the variety of locations in its 17 chapters. DS Aragorn's Quest's 8 hour game length is decent, although it really needs more set pieces. Even DSiWare's Hero of Sparta had some variety to its action, with a huge cyclops in the background attempting to crush you, as that game took inspiration from God of War. Then again Hero of Sparta's game length is much shorter than in Aragorn's Quest and TT Fusion's game has extra Arenas to unlock as you progress, too. @JayArr Ha, ha, they are pretty maps indeed and fairly functional. They only display the areas which you have already explored and open up as you progress, but they are handy to find fires to light your torch, Elven health pools and for entrance/exit points on the levels. There is not that much to discover though, and progress in this game is linear. Someone needs to make a hack n slasher that's engaging in single player. Not a single damn one - not Gauntlet, Untold Legends, Diablo, Dark Alliance, Torchlight or anything else - can avoid the monotonous gameplay without multiplayer. Can we PLEASE move away from the "click on target to kill" crap from the old PC games that we all base these top down hack n' slashers off of? Can SOMEONE put in a decent combat system? I'm not asking for full blown top down God of War here, but a throw and a counter move would certainly help, as would some genuinely varied enemies/enemy classes. And more dynamic environments with traps and stuff.